I was born and raised on a farm in eastern Montana and it will always be one of my favorite places on earth. I moved to North Dakota in 2000 when I left to attend engineering school at NDSU (Go Bison!). While there, I met my sweet husband, a North Dakota boy. We moved to Bismarck after school, and it has truly become home to me. I am blessed to be here, raising our two children. Those who know me well know that I am obsessed with beautiful presentation and am a bit of a neat freak, in only the best way, of course! Decorating my home, party planning, baking, and projects with my children are some of my favorite ways to satisfy my endless desire to do something creative. For as long as I can remember, I’ve always been in awe of the way the sunlight can change the way something appears. I remember spending hours on the school bus as a young child, staring out the window, studying the way the light fell on the hills and fields along the route. It is this wonder of light that really led me to become passionate about photography. Now, after working as a professional photographer for ten years, that passion is shared with another love of mine, interacting with children and families. Aside from raising my own family, I truly believe that one of the most rewarding experiences of my life is that I’ve had the opportunity to document the lives and the love of so many families throughout the years. And it is incredibly rewarding to know that for generations to come, my images will be a lasting memory of who their family once was and where they came from. 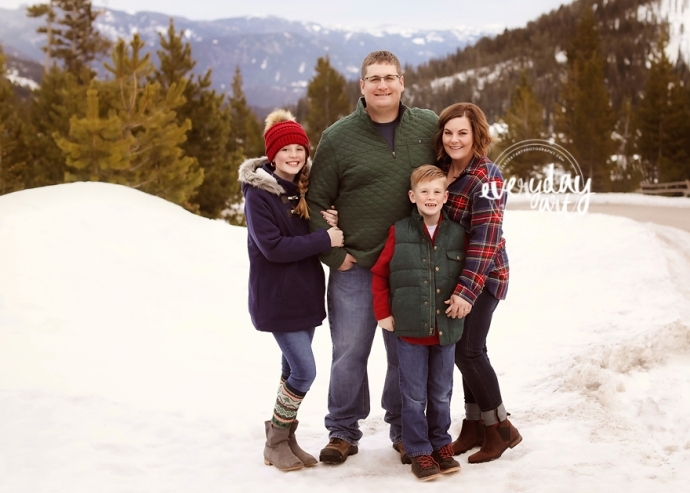 Here’s me with my family in one of my favorite places, the mountains of Montana!